The first episodes are a little boring, but later on in the series, it gets better. Every time I pick up a new sport, like basketball, I'm inclined to start another series that's based on that sport like Kuroko no Basuke. 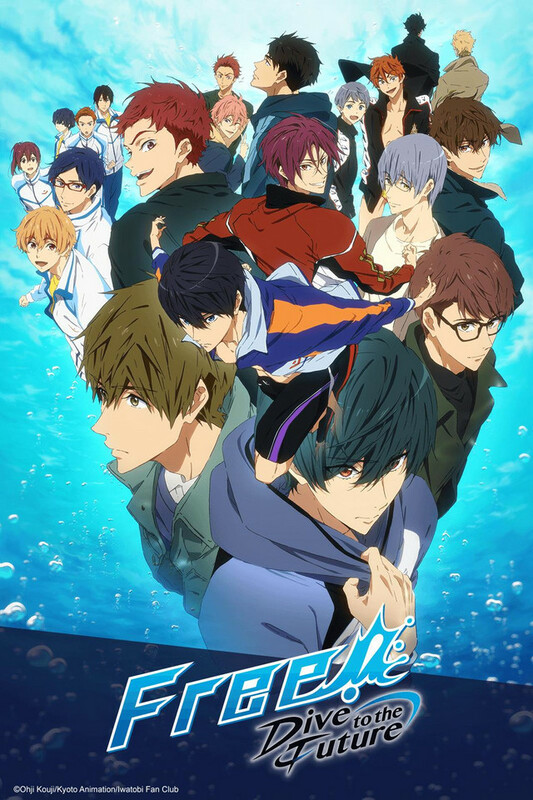 I never swam competitively but this anime still has me craving for more. The characters are so beautifully drawn and the animations are stunning. Still waiting for season 4! I was a crazy swimmer and miss it a lot and am the one you have to tell to get our of the pool or water after I become a prune. I am also an Olympic junkie. I love to watch swimming as well as be a part of it. Therefore I was thrilled when I heard out there was a show that was all about swimming. The characters all have great personalities that you either get annoyed with or really enjoy learning more about. I think sometimes this show gets a little stuck and slow, but really the animation and story are great. I wish they showed females swimming too in these, and I only saw ONE girl in the pool in competition in one of the very last episodes of the three seasons only. I understand they were focusing mainly on the main characters, but women and men, boys and girls all train together. . .unless they don't really do that in Japan? I don't know, it was just a little weird to not see more of that. This is a great story about friendships all in all. Free! is one of the most interesting anime's I've ever watched. The plot is compelling, the characters are interesting, and has wonderful sense of humor.Not to mention, I don't mind the occasional "fan-service." I defiantly recommend this Free! Iwatobi Swim Club. The two first seasons were amazing and third season did not disappoint me one bit. The story is great, tons of drama and cute moments, and I am very happy to see some older characters from the movies such as High speed. Interesting to see how they are now compared to in the movie. It's nice seeing the characters develop their mental stage. I'm a big fan of Haru, Ikuya and Makoto so I am glad to see that they play such a big part in this season. It's also nice to meet some new characters that we get to know more about through the anime. The whole anime series, Free! Is without a doubt on my top 5 list of all time anime I've watched so far. Super sweet and cute anime, and season three along with tat. But that just means the anime is good. Five stars and overwhelmingly good. Thank you for publishing such a masterpiece. This series is absolutely amazing and this new season doesn't disappoint! As being a fan for a long time, I am glad to see that the creators are still able to bring us content that doesn't stray far from how the work was in the first and second season. I hope to see another season, but if not then this one was a good one to close the series with. Make some FREE time and watch this anime! I recall seeing a promo for Free two years ago before I started to actually watch it. The promo hooked me with the HD quality of the water and how well-drawn the characters were. Muscles, abs and how the water looked so damn refreshing! I completed Free and my expectations of this anime from seeing that promo were definitely met. After seeing this anime, I highly recommend anyone who hasn't seen it, to please watch it. This is a great casual anime to binge when you have the time and if you ever need a bit of inspiration/motivation. Free is a sports anime, but it's also a slice of life because it really emphasizes and focuses on friendships and following your dreams. Of course, the competitiveness is there and will have you rooting for your favorite character(s) to touch that wall and win! Honestly, this anime is great for girls with the close-ups on the bodies, but guys, don't let that stop you from watching this. You'll definitely relate to the characters no matter how old you are. If you finished high school already, it can create some nostalgia on memories of what you did with your friends in high school. And it will have you thinking and reflecting back on what you aspired to be when you were younger. I felt Free is one of those anime that can get you to feel inspired and get yourself motivated to fulfill what your younger self would have wanted or dream of doing. The friendship and how well-connected the characters are with each other is a must see. The bonds are beautifully developed and there are so many hilarious moments. Aside from friendships, this anime shows you real-life situations that anyone can relate. This anime will have characters that are naturally born with talent and characters who have to work hard to achieve their dreams You'll witness dedication, determination and confidence from the characters. Of course, you'll witness the struggles, jealousy, and hard-work that some of the characters had to endure to get to where they are. Watching Free, you'll definitely want to swim or learn how to swim if you don't know how already. It's such a refreshing and relaxing anime if you ever need a break from the shounen anime.Of course, I can't deny how incredible the characters look when they are swimming, so ladies or men you are definitely in for a treat on that part. Lastly, the animation as I mentioned in the beginning of this review, is spectacular. Makes me wanna go take a swim! A sports anime with a lot of humour, drama and character development. Free! has some really nice animations, and it's certainly not only for a female audience. Don't be put off by that, you'll miss out on a great sports anime. Also, all the openings and endings are fantastic. My favourite episode so far is the Eternal Summer Special. I love how it doesn't take itself so serious. When I began watching this show a few years ago, my first thought was, "What the hell am I watching? I am too old for this." Now, years later, watching this new season of free is like coming home. #1 - It is a fujoshi dream. Cute boys. Enough ships to keep you busy. #2 - It is legit a good sports anime. I was on swim team in high school (which was not nearly as cool as this is) so I love to watch them compete and practice and overcome obstacles. #3 - Who does not love a show where you literally get to watch the characters grow up. They are in college now and getting to be adults. I love it!! Its back and better than ever! Based on the first episode, I know it's going to be a good season! I didn't expect another season. It was a pleasant surprise to discover this! Makes me want to re-watch the series again lol. I hope the new series will pass my expectations of the previous shows.